No matter where you go in Michigan, you’re going to find something fantastic. The “Yoopers” will tell you that the Upper Peninsula is heaven, with its lakes and islands; then there are the beaches and vibrant culture of Traverse City, and spectacular golf in Gaylord. There are plenty of spots for skiing, too, and the snowmobiling is world-class. We suspect that this wide range of activity (we haven’t even begun to list them all) is why it’s so famous for family vacations, and why so many of the resorts here seem to offer…well, almost everything. Here are our Top Michigan Family Vacation Getaways! If you like the idea of a convenient, all-inclusive family vacation with countless lake and beach activities, you'll love the White Birch Lodge. Family owned and operated since 1958, the all-inclusive White Birch Lodge family resort in Northern Michigan loves turning your family vacations into family traditions. The White Birch Lodge was started with the idea of providing an all-inclusive vacation where the staff takes care of all the work, so parents can relax and enjoy their time with their kids. And enjoy they do, year after year. Located on beautiful Elk Lake, watersports are the big thing here. With wakeboarding, water skiing, tubing, kayaking, windsurfing, you name it, it’s available. And since it's all-inclusive, it’s all-convenient, with meals, kids activities and programs, and more provided. Parents can spend a week without saying no, and kids can run themselves silly with activities. Everyone wins! Once the sun goes down and it's too chilly to go in the lake, fear not - the activities don't stop! Evenings are full of fun and entertainment, such as sports night, square dancing, and a ski show put on by the staff. The White Birch Lodge offers a variety of great children's programs, so Mom and Dad get to be on vacation too! Monday through Friday children can join the staff for art projects, sandcastle building, games, a pontoon ride, nature walks, and so much more. Here’s another Michigan resort that has it all for your family vacation. Do you doubt? Well, to start, there are 54 holes of championship golf. Then there’s the indoor water playground. A full-service spa. A licensed day care center. Heck, there’s even a 24-hour dog care facility. What makes matters even better at Grand Traverse Resort and Spa is that all of this is situated on 900 acres, including a private beach on East Grand Traverse Bay. Something about this setting makes the three golf courses, including The Bear by Jack Nicklaus and The Wolverine by Gary Player, even more amazing and somewhat less frightening. There’s also a 100,000-sq.-ft. health club, which isn’t even limited strictly to health; besides the indoor and outdoor tennis courts, cardio theater, yoga studio and more, there’s a lounge with a large screen TV and an arcade. Three accommodation choices – the Tower, with 186 luxury rooms and suites in a 17-story glass tower, a 238-room hotel and 190 beachfront or fairway condominiums – ensure that your Michigan family getaway is suited just for you. Do you still doubt? Stop in and see for yourself! Those old German fairy tales we heard during childhood will never leave our memories, and it turns out they don’t need to – they live on in Frankenmuth, Michigan. Which is precisely the reason why the Bavarian Inn Lodge of Frankenmuth makes our Top 10 Michigan Family Resorts! The whole idea of a Michigan family vacation – or a vacation anywhere – is to immerse yourself in a new environment, and in this case it’s a classic Bavarian village. And when it comes to authenticity, you can’t get much closer to Bavaria without going there. From the buildings to the architecture to the people, Frankenmuth and the Bavarian Inn are still clearly connected to the Bavarian missionaries who arrived here in 1845. That doesn’t mean that there isn’t plenty of modern family fun. The inn features five indoor pools and three whirlpools, an 18-hole indoor miniature golf course, a two-story children's village play area and an arcade. There are two German-themed restaurants, free family karaoke and sing-alongs with Willy the Dragon nightly. Bavarian Inn Lodge is not just a vacation with your family – it’s an entirely new family experience! Visit the Ratskeller and become the next Bavarian Idol during Family Karaoke every Friday and Saturday night at the Bavarian Inn Lodge from 8 p.m. 11 p.m.
Each of the 300 European-style guest suites at Bavarian Inn Lodge contains information on the history of a local Frankenmuth family. This is a place built on a genuine love of the entire resort concept, and it shows in everything you’ll find here – which is a lot. Crystal Mountain Resort and Spa has been family owned for nearly half a century, a lot of time to develop the finest in Michigan family entertainment. You’re probably familiar with family entertainment, but here it takes on a whole new dimension. It’s not just golf – it’s 36 holes of golf, plus a renowned golf school with more than 80 courses. You don’t just go swimming in the pool, either. At Crystal Mountain Resort, the pool is 4,200 sq. ft. of fun which starts at zero-depth and goes to three competition-length lap lanes in as much time as you’d care to take. The water playground is fun, too, especially if you’re a kid, and there’s also a sand play area and a 32-ft. climbing wall that doesn’t necessarily require any climbing experience. We haven’t mentioned anything for winter, but we’re about to: how do 45 slopes, terrain parks, a half pipe and more than 40 kilometers of cross country ski trails sound? That’s all here too on Crystal Mountain, and just a part of your year-round fun at Crystal Mountain Resort and Spa. The Peak Pool & Fitness Center is open once again, with an 1,800-sq.-ft. addition and facilities such as a pool, hot tub, fitness equipment and a boutique. From Traverse City, take US-31 south to Thompsonville Rd. (County Rd. 669), which is 10 miles past Interlochen. Follow 669 south to Thompsonville. Turn right at blinker light and travel miles to Crystal Mountain Resort. The new 18,500-sq.-ft. Crystal Spa in the heart of Crystal Mountain honors the art and natural beauty of northern Michigan. Spend a fantastic, fun-filled week on Lake Michigan with the kids at Bay Harbor Village Hotel. Bring the family for an unforgettable vacation at Bay Harbor with Lake Michigan just steps away from your hotel. Situated in the Village at Bay Harbor, enjoy shops and restaurants at your fingertips. Sunset Beach is just a short walk from the hotel for sunbathing, a quick swim and building sandcastles. You can also rent a boat for a day on the lake at Lake Michigan Yacht Sales in the Village. Take the family on a fishing charter docked at Bay Harbor Lake Marina or enjoy a day by the pool at the Swim & Fitness Club. Fabulous golf courses are also in very close proximity to the hotel, as well as the Little Traverse Wheelway which is a 23-mile bike and walking path that connects to all the wonderful waterfront resort communities in the area. Bay Harbor Village Hotel is conveniently located near two fantastic golf courses: Bay Harbor Golf Club and Crooked Tee Golf Course. Bay Harbor is right on Lake Michigan and Crooked Tee is on the hillside. Both courses have sensational views of the lake! Guests at Bay Harbor Village Hotel have exclusive access to the luxurious Bay Harbor Swim & Fitness Club, which has a full-length pool and Jacuzzi, and offers swimming classes. There is also an array of fitness equipment. Enjoy an old-fashioned family vacation at Chimney Corners Resort! Chimney Corners Resort is a traditional, family owned resort that will make your next family getaway unforgettable! Whether you stay in their cozy apartments, their private beach or bluff cottages, or in the 100-year-old main lodge, you're sure to find comfortable and rustic accommodations to suit your family's need. More than just a comfortable place to rest your head, Chimney Corners is located near a wealth of family fun! On site, you can have a family barbecue, go swimming in the lake, take a hike, or lounge on the beach. Nearby, you'll find even more: climb Sleeping Bear Dunes, try a slice of the Cherry Hut’s famous Cherry Pie in Beulah, and much more. If you're looking for a perfect adventure for your family, try canoeing or kayaking on the Platte River! Chimney Corners has been open since 1935, when Leola and Olin Rogers opened the main lodge as a guesthouse. Bayshore Resort looks a lot like one of those Victorian-style bed and breakfasts where you might go without the kids. Which you can – there are plenty of fireplaces and two-person whirlpools here. But the real beauty of Bayshore is that it’s equally suited for a complete Michigan family getaway. Witness the beach – directly outside the door, the sand begins and doesn’t stop until it’s submerged beneath West Grand Traverse Bay. This location also means that fishing and skiing are equally close by, along with winery-hopping on Old Mission Peninsula, exploring nature on Leelanau Peninsula or shopping just a short walk away in downtown Traverse City. If Bayshore Resort’s exterior Victorian style is impressive (and romantic), wait until you discover what’s inside. An indoor pool and whirlpool are great for family fun, and the game room is never far away. Each day starts with complimentary breakfast. 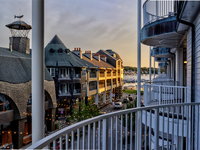 In short, Bayshore Resort is a terrific way to add some timeless style to your modern Traverse City family vacation! The rooms and suites at Bayshore Resort offer style and grace to a Michigan family getaway, including Bayview, Poolview and Bayfront Rooms. 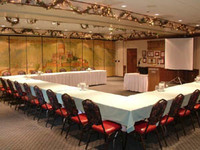 Second- and third-floor meeting rooms at Bayshore Resort each seat up to 89 people theater-style, with A/V equipment and more. Enjoy four seasons of family fun at Trout Creek Condominium Resort, which showcases Michigan's breathtaking natural splendor and spectacular year-round amenities. The resort is located in the heart of Michigan Ski and Golf country and offers discounts on golf at area championship courses and Sheplers Mackinac Island Ferry and lift tickets at neighboring Nubs Nob and Boyne Highlands. Lake Michigan beaches are nearby, perfect for boating, fishing, and swimming. Terrific hiking, biking, and the resort towns of Petoskey, Harbor Springs, and Mackinac Island all make this the perfect family getaway. The resort itself offers an array of adventures for all ages as well. Explore shimmering swimming pools, fishing ponds, hiking trails, and tennis courts. Their beautiful rental condominiums offer central air conditioning and are non-smoking, perfect for families and friends! Spacious rooms can accommodate families of all sizes and keep everyone entertained with a game room, free Wi-Fi, and much more. Endless family fun awaits! Your family can find an array of aquatic adventures at nearby Little Traverse Bay and Lake Michigan, which provide the perfect outdoor playground for water skiing and boating. Frequenters of the fairway can tee it up on many nearby golf courses like True North, Little Traverse Bay, and Black Lake! Look out the window at Drummond Island Resort & Conference Center, and a sense of tranquility will overtake you. The 2,000 beautiful acres of woods, water, and wildlife serve as a perfect complement to your rustic accommodations. Drummond Island is the largest freshwater island in the United States, as full of natural beauty as it is hospitable locals. Drummond Island Resort is open year round and is glorious regardless of the season. Every amenity and service at the resort is designed to complement your Northwood’s experience, from comfortable accommodations and excellent cuisine to the long list of resort activities that guarantee a refreshing and satisfying stay (including the 18 hole championship golf course, The Rock, a must for golfers). Most don't think "island paradise" when they think Michigan; you will after a stay here! At Drummond Island Resort and Conference Center, there's something for everyone. Spacious accommodations ensure the whole family has a place to stay comfortably, while the onsite activities ensure you'll have a blast together. With over 150 miles of shoreline, you can enjoy plenty of fun outdoor activities such as kayaking, guided paddling adventures, and pontoon and fishing boat rentals. A fitness center, heated outdoor pool, and tennis courts are also available, as are free loaner bikes, kayaks and canoes. Recently featured in a New York Times travel cover article, the Kingsley House specializes in romantic getaways and unique theme packages. Relax on the shores of Lake Michigan, explore the waters on a cruise, or cast a line. Enjoy your favorite winter adventures including cross-country skiing and winter hiking at the Allegan State Forest and Saugatuck Dunes' State Park. Give your family an unforgettable lakeside getaway at Sojourn Lakeside getaway. Here, you can enjoy a wealth of outdoor activities including swimming, boating, hiking, lawn games, and more! Head to Gaylord to start your fun today! With 35 acres of private wooded land creating the property, Sojourn Lakeside Resort offers plenty of hiking trails to help explore this picturesque area at your own pace. If you'd rather stay close to your comfortable accommodations, bring your family together for an impromptu game of horseshoes or softball. The adults can enjoy a Social Hour at Sandbar Lounge while the kids enjoy a sunny, fun-filled day on 700' of Dixon Lake beach. At the end of a great day, head to the beach for a bonfire and make sure to bring along marshmallows for S'Mores. With all of this talk of the fun you can enjoy with great onsite amenities and activities, we nearly forgot to discuss the comfortable accommodations. Suite accommodations feature refrigerators, microwaves, a soaker tub (Jacuzzi Suites available), and robes for individual guest use. Give your family an unforgettable getaway along the shores of Dixon Lake at Sojourn Lakeside Resort. You won't regret it! There's nothing more relaxing than morning yoga on thebeach or a sunset session on the deck at Sojourn Lakeside Resort. The hospitality staff is happy to help you set up a session during your stay. Sojourn Lakeside Resort originally opened in 1948 as a guest ranch and then as a dude ranch before becoming El Rancho Stevens, which served it's last guests in 2004. Conveniently located in the heart of Michigan's beautiful north country, Big Bear has been providing exceptional vacations to families for more than 30 years. Yours should be next! An ideal place to bring a family year-round, Big Bear has a tremendous amount of charms and amenities to capture your hearts and minds. 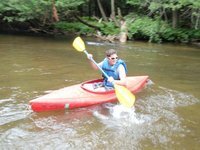 The outdoors are truly great here, whether you're paddling down the crystal-clear Sturgeon River in a rented canoe or kayak, playing some golf on a nearby course, or testing yourself on the resort's rope course. Your family's experience can be as relaxing or as busy as they'd like. Meanwhile, the surrounding area abounds with wildlife, pristine rivers, lakes and forests, and hundreds of miles of hiking, biking, and snowmobile trails, providing unlimited opportunities for the outdoor enthusiast. Last but not least, your family will be staying in supreme comfort inside your cabin. What more could you want? Less than 1 mile from I-75, Big Bear Adventures is also within an easy 30-minute drive of many resort areas such as Petoskey, Gaylord, Harbor Springs, Charlevoix, Mackinaw City, Mackinac Island, and St. Ignace. Check out the mini-golf and ropes course! Discover big family fun at Big Powderhorn Lodging Association! You'll make a mountain of memories with year-round fun that includes hiking, skiing, and plenty to do onsite. There's exploration for everyone here. Come escape into the natural splendor of this Upper Peninsula palace! Kick off the family fun during the warmer months, when the Upper Peninsula abounds with outdoor adventures for all ages. Mountain bike through the tree-lined wilderness, fish on the pristine lakes, or hike along the North Country Trail. Catch a tan on Lake Superior beaches or embark on a kayaking expedition through Lake Superior or waterfall-lined rivers. Come winter, carve up the slopes of Big Powderhorn Mountain Resort. 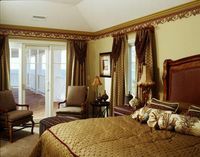 Afterwards, relax in a deluxe villa, condo, or vacation home. With amenities like ski in/ski out access, fireplaces, and hot tubs, your family will feel right at home while also being just a stone's throw from adventures. With lodgings that can accommodate as many as 16 guests, you can bring the entire family for an unforgettable stay! Spacious vacation homes are perfect for housing family reunions. The group can hike along the lush trails, which are lined with waterfalls! Set off on a chartered fishing trip on Lake Superior and reel in lake trout, coho salmon, steelhead, and chinook salmon. This award-winning property is an ideal family destination, not least of which due to their superior hospitality! Bay Pointe Inn Lakefront is a completely unique and desirable destination, known for its exceptional farm to fork cuisine and incredible comforts and amenities today’s savvy travelers desire. Take a stroll along the 375 feet of lake frontage, dine in the celebrated Terrace Grille Restaurant, or just relax in one of the 39 designer inspired guest rooms. The resort's engaging hospitality and commitment to excellence will give your family memories that will last a lifetime! The hotel is an 8-minute drive from the Yankee Springs State Recreation Area. Complimentary breakfast is provided in the grill restaurant, which has a lakeside patio. If you're looking for the perfect place to vacation with the entire family in Northern Michigan, look no further than Holiday Vacation Rentals. Choose from their wide range of luxury Northern Michigan rentals and enjoy stunning views of Lake Michigan. Holiday Vacation Rentals makes it easy to reconnect with your loved ones. Their spacious homes are just minutes from miles of Lake Michigan shoreline where you can relax with the kids, build a sandcastle, or dive in for a swim. Some homes are pet-friendly! For those who can't leave their pet behind Holiday Vacation Rentals got you covered. Enjoy Lake Michigan and go on fishing trips, explore hiking trails, and much more. There always something to do for everybody! Plan a road trip with your family and drive down the M-119’s Tunnel of Trees. A 16-mile scenic road that begins in Harbor Springs and ends in Cross Village. This narrow road is designated as a Scenic Heritage Route, and it lacks a center line. Go on a rock hunt along the shoreline and see who can find the most Petoskey stones. Rock hunting is always a fun outdoor activity for any season.